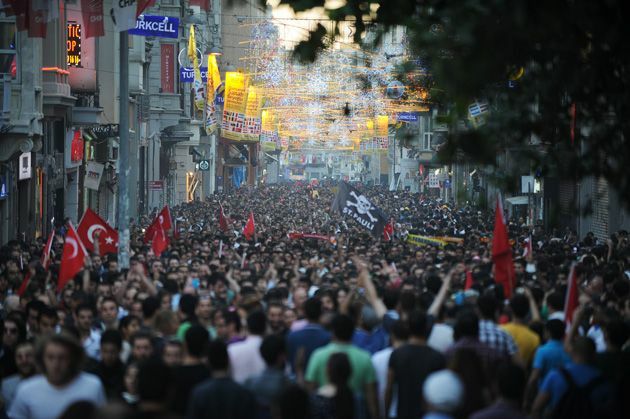 Turkey is experiencing its largest and most violent riots in decades as tens of thousands of young people voice opposition to the moderate Islamist government of Prime Minister Recep Tayyip Erdogan. Thousands of protesters have been injured as authorities have sought to disperse demonstrators with tear gas, water canons, beatings, and a tightening grip on the media. On Monday, Erdogan accused the protesters of "walking arm-in-arm with terrorism." Yet his defiant response is only making the crowds larger. 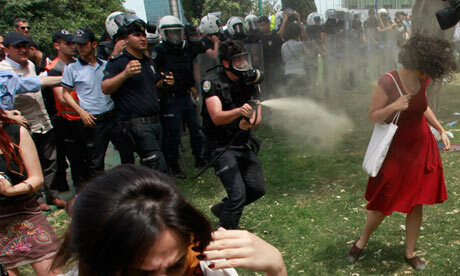 In an echo of the Arab Spring and the Occupy Wall Street protests of 2011, the movement has been galvanized by images disseminated on social media, such as a picture of a policeman spraying tear gas at a young woman in a red summer dress, her long hair swept upward by the blast. "The more they spray," reads a popular Twitter caption, "the bigger we get." Why are people protesting? Nominally, the protests were sparked by a government plan to replace Istanbul's leafy Taksim Gezi Park with a touristy shopping mall—what the country's leading historian, Edhem Eldem, sardonically derides as a "Las Vegas of Ottoman splendor." Trees are especially precious in Istanbul, where only 1.5 percent of land is green space (compared to 17 percent in New York). But the protests quickly became symbolic of much broader concerns about Erdogan's autocratic and socially conservative style of government. Istanbul's secularists chafe at the way he has rammed through development projects in this cosmopolitan cultural crossroads with little regard for the European and non-Muslim aspects of its history; a 19th-century Russian Orthodox Church may be destroyed as part of an overhaul of a port. What's more, Erdogan has placed new restrictions on the sale of alcohol and availability of birth control. And he has jailed political opponents and members of the media. How widespread are the protests? Since Friday, there have been demonstrations in 67 of Turkey's 80 provinces, according to Turkey's semi-official Andalou News Agency. At least 1700 people have been arrested. What about damage and injuries? Photos show fires in the street and overturned and burned-out cars. Two protesters have been killed, one from a bullet fired from a police vehicle, reports Turkey's Halk TV. According to CNN, at least 115 security officers have been injured. On Tuesday, the Turkish Doctor's Association told Reuters than some 3,000 people have suffered minor injuries such as lacerations and difficulty breathing due to exposure to tear gas. Four people remain hospitalized in critical condition. Is Erdogan just another Islamist dictator? Not according to Washington, which holds up Turkey as a shining model for democracy in the Islamic world. Since coming to power in 2002, Erdogan's Justice and Development Party (AKP) has twice returned to office with large pluralities of the vote. In recent years, Erdogan has kept up the pace of democratic reforms in Turkey by enshrining individual rights in its laws and placing the military under civilian control. "Yet even as the AKP was winning elections at home and plaudits from abroad," writes Foreign Policy's Steven Cook, "an authoritarian turn was underway…"
In 2007, the party seized upon a plot in which elements of Turkey's so-called deep state—military officers, intelligence operatives, and criminal underworld—sought to overthrow the government and used it to silence its critics. 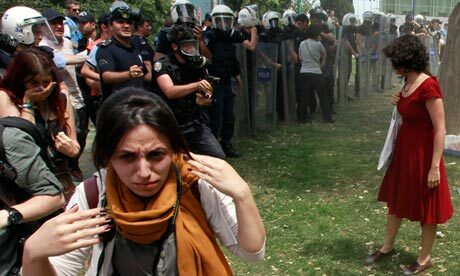 Since then, Turkey has become a country where journalists are routinely jailed on questionable grounds, the machinery of the state has been used against private business concerns because their owners disagree with the government, and freedom of expression in all its forms is under pressure.